Bet Online Casino is an instant-play only internet gambling provider, which has a different approach to player bonuses than most of its competitors. Standard offerings do not include the usual no deposit bonuses or free spins incentives. You can find occasional promo coupon and voucher codes on the web, but these come and go. Similarly, there is no first deposit promo. However you can still get a bonus on your first deposit, and subsequently on all further deposits, providing you purchase $100 or more in chips. If you are prepared to deposit $100 or more, you qualify for a 100% in free chips to match what you pay in (only for use on slot games). If deposits of $100 or more are beyond your budget, you can still take advantage of 25% in free chips with a Bet Online Casino Bonus any time you deposit $25 or more. The site also offers a high roller bonus if you hold over $75,000 in your account, as well as an invitation only 10% rebate program. Compared with competing brands though, particularly Bovada Casino, these bonuses do seem to be rather frugal on the part of this provider. If you own an Android mobile device, or an iPhone or iPad though, you might find the downloadable app, giving access to this provider's games more than makes up for a lack of tempting bonuses. Certainly the ability to offer gamers a go-anywhere experience on any mobile device is something many competitors lack. Bet Online Casino enjoys massive popularity in the United States and Canada. Members from the USA are accepted, which naturally makes it a popular brand there, but so does the fact that it's a sports betting and poker provider, as well as being a professional and well-run home for slots and table games. Blackjack is one of the most popular games offered by Bet Online Casino, perhaps because of fans crossing over from other sections of the site. There are seven variants of Blackjack to choose from here as well as other table games like baccarat, Roulette and Craps. If you're looking for some slots to make use of your Bet Online Casino bonus, there are plenty of all kinds to be found. Some of the firm favorites are 2 Million BC, The Slot Father and The Invaders. This brand runs titles from Digital Gaming Solutions and Betsoft. The Betsoft games in particular will appeal if you like lots of features like scatter symbols and free spins. At the time of review, no jackpot winner details could be found. The brand does not name winners or jackpot amounts on the site. This could be something for the owning company to address, as it's nice for prospective members to check out the possibilities. There are plenty of good testimonials from players which are published, but this is no substitute for some evidence of player success. 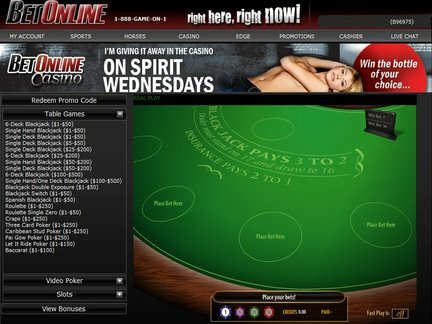 While there are a few complaints floating around about Bet Online Casino, they mostly relate to the Poker room and even these are not recent. There doesn't seem to be any major issues. Of course there aren't too many bonuses to complain about, as this is not something the brand offers, at least not for new members. It's no surprise therefore; that there are no obvious complaints recorded about no deposit bonus or free spins issues. This provider gets a rating of 4 out of 5 for complaints and handling. Bet Online is a company in its own right and was established in 1991. The Casino section of the website has been around since 2001 and the gambling license is held in Panama. Like most internet gaming providers today, the sign up process is simple and fast. One thing I found a little confusing is that some of their promos require you to enter coupon codes and some don't. With most providers, you either need voucher codes or you don't, so this is something of an unusual and for me, unnecessary mix. This is really a minor issue though and I soon forgot about it when I found out I could try the games out via a mobile app for iPhone, IPad and Android. I was even happier to find that the game loading times are really fast, even on small devices. One problem I normally find with instant-play only venues is slow loading - Not so with this brand. If I had to say anything negative about this brand, it's just that the overall sense I got when playing the slots and other games, is that the whole thing is just kind of a bolt-on, supporting the other aspects of this wagering venue. Also the lack of no deposit or welcome offers was disappointing. All in all though, I could find no reason not to recommend others to play here, especially if mobile gaming is your preference. Overall rating is 3 out of 5.